It’s common to go to the internet to find a list of the best. From recipes to product reviews internet lists are often accurate and valuable when it comes to making a decision. But when it comes to finding the best SEO companies, can these list of best ranked companies really be considered accurate? I’ve been in the Search Engine Optimization business for well over 10 years. In fact, I first started back in 2006 when things were much simpler and easier. I’ve watched countless trends come and go with fortunes built and lost, all from SEO and its ever changing landscape. 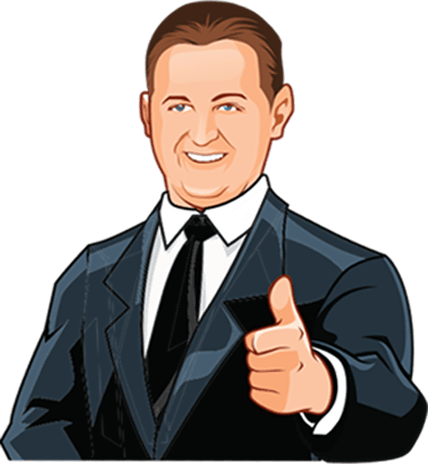 Those who know me know that I’ve dealt with hundreds of SEO companies throughout the years thanks to our proprietary seo software and services. As of writing this post I’ve worked with over 900 different SEO Companies or experts to help them rank their sites or client sites. We’ve met and dealt with all kinds of SEO people. Without specifically calling any company out; I’m always surprised to find the level of incompetency that exist at the big SEO Firms. Anyone who’s hire these large SEO firms knows what I’m talking about. We’re constantly hearing from potential clients about their horrible experiences they’ve had with the big name SEO companies. Not only do they get poor results, often times they cause lasting long-term damage to their websites that are hard to repair and fix. 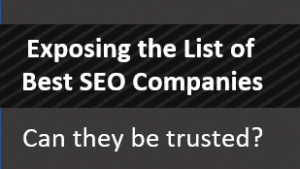 Can You Really Trust These Lists of Best SEO Companies? At the risk of upsetting some of the people behind these popular lists sites, I feel its time to expose how they work. I’ve been a long-time friend with one of the major sites that shows up in the search results for list of best SEO Companies. The guy running this particular site is an amazing SEO. He knows what he’s doing when it comes to ranking sites organically. However, the list of ranked SEO Companies that are shown on his sites have little to do their skill and more to do with their size, or rather the size of their pocket book. Let me explain. I’m frustrated by seeing so many good legitimate businesses getting duped or tricked by these lists. The methods being used by many of the big SEO companies found on these lists are often outdated and extremely risky. Its so bad that we often have to turn down new clients because they hired a previous company that left their site penalized. To help you from falling victim to these “Best Ranked” lists, I feel its time to expose how they really work. The information I’m going to share is not something widely known. In fact, these list sites go to extreme measures to prevent this information from getting out. As far as you know, they are ranking SEO Companies based on their ability to rank their clients sites in search results. However, this couldn’t be farther from the truth. Take note and notice the way these sites are ranking SEO companies. They are often grasping for different metrics such as: Year Founded, Revenue, Number of Employees, Number of Active Clients, etc. All of which really mean nothing about their ability to rank your site. Sure, you can argue that larger means better, but does it? Exposing the List: It’s Pay to Play. This shouldn’t really come as a surprise, but these lists are pay to play. Meaning that the more an SEO company pays, the higher they’ll rank on the page. My friend charges SEO Companies on average $30,000 to $50,000 a month to be listed on his sites. To top that, he often requires a minimum of 6 months. As you can see, its all about the money and has nothing to do with the actual results a company can deliver. He knows it, I know it, and now so do you. When I’ve asked him about how he can accept companies that he knows are not good at SEO, he simply says that its the buyer that needs to do the due diligence and not him. He’s just providing a list and they can do with that information what they want. Obviously, I don’t need to speak on the many ethical issues that arise from these lists. But I can at least shout out to you to let you know that things are not as they appear. Trusting a list of SEO Companies on the internet could land your site in a the hot seat or penalty box. Recent Change that is Good News. Over the last couple of years the FDA has been cracking down on fake reviews and lists. 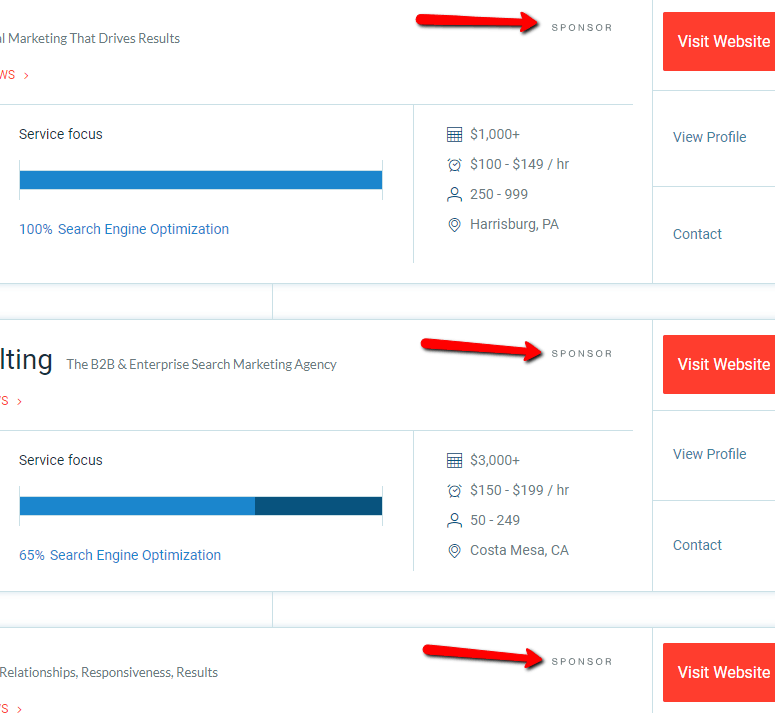 Because of this we’re starting to see more of these lists of best SEO Companies showing when a result is sponsored or not. Granted, they try to make this blend in and not stick out, but on some of the more reputable list sites you will see the something that says sponsored or paid, etc. Keep in mind, whenever you see the result is sponsored, then you should assume they aren’t necessarily good at SEO. Don’t get tricked by these clever sites, its simply not worth risking it. When it comes to hiring the best SEO company, its more about what they can do for you specifically than it is about what they’ve done. The best SEO company for you is one that is committed to your success and cares about your goals and can provide you affordable SEO Cost. Some of the better SEO companies I’ve dealt with are small, but passionate about what they do. Search Engine Optimization is a lot of work and requires experienced people that understand your business. There are a lot of choices when it comes to hiring an SEO. If you pick the wrong company it can result in long-term financial devastation (if you rely on web traffic), or it can be the very thing that pushes your business to the next phase. Regardless of who you choose, don’t be fooled by these common list of top ranked SEO companies, they are loaded with pay to play sponsors who will almost always provide you with little value. 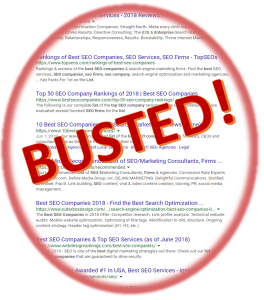 Too often we find good companies like yours that have been tricked by these lists and end up hiring an SEO that does more harm than good. A general rule of thumb is to hire someone who is more worried about the results than they are about closing the deal. Long-term contracts of 6 months or more should be a huge red flag and avoided at all cost. A reputable SEO has no problem offering their services on a month to month basis because they know they can produce results which will drive in revenue for you. Companies that can’t get results will try to lock you into a long-term agreement that provides no advantage for you and only serves them. There should be no need for long-term contracts, unless it benefits you with a lower rate or some added value, but even then this should be your suggestion and not come from the company trying to sell you a results based service. Search Engine Optimization takes time, but that doesn’t mean you should have to be committed to a long-term contract. The best advice I can give is to use common sense when it comes to hiring an expert SEO to work on your site. Look for red flags such as paid ads, high pressure sales, slick marketing material, long-term contracts and sales people who focus on emotions rather than results. Its not always easy to spot the honest and ethical companies, but a tale tale sign is when you find a company that is vetting you as much as you are vetting them. Its one of the few business deals where you might actually be the one convincing the SEO company why they should work with you. The best SEOs are always picky about who they work with, but if they are any good they can drive in crazy amounts of business and revenue to your business. SEO is one of the few marketing channels that provides such a high long-term ROI. Whatever you do, hire an SEO; but avoid the red flags! 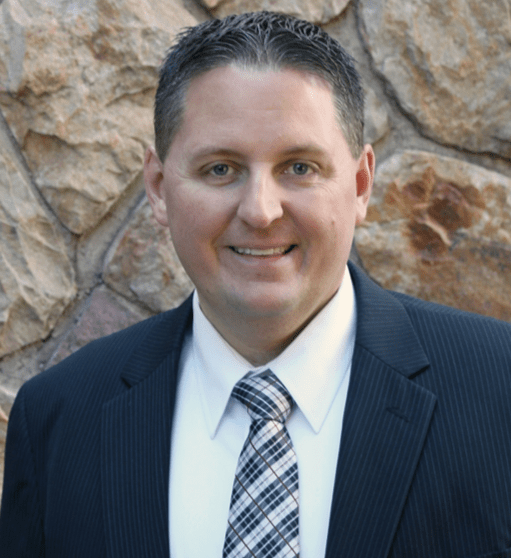 Scott A Paxton is an award-winning SEO Consultant who specializes in creating smart technology to better understand search algorithms. Since 2006, Scott has been working full-time in search optimization and has helped some of the nation's biggest brands thrive online. He's passionate about SEO, and loves his wife and three kids. From basic concepts to advanced search technology, hire the industry leaders to speak at your events. Who is Scott A Paxton? What are Keywords, and How Will They Help My SEO?